Might rattle against the rack when empty. Use a piece of rubber to solve this problem. When you first heard about the Topeak DXP bag, you might have thought, “it’s too expensive for a bag!” And if you did, then join the team of the DXP owners. The vast majority of us thought that this bag is too expensive at first. And googling for a similar solution either found us even more expensive solutions with less advantages than the Topeak DXP, or some cheap bags so poorly made that you felt the need to close the website that’s selling them. Remember, the majority of us can’t afford to be cheap. So pick a bike bag that you definitely like. I hope this Topeak MTX Trunkbag DXP review will help you in your quest for a great bag! You like the idea of coming to work or home and take the bag off your bike in 3 seconds. This is possible thanks to Topeak’s MTX system. Trunkbag DXP is MTX compatible, and you need a Topeak MTX compatible rack to use this system. I have the Topeak Super Tourist DX rack myself. You want to take stuff with you on a 2-3 day bike tour. Or if you’re like me, you like to take food and water with you even if it’s for a one-day trip. You think you will never need panniers, or already have those. Then I’d recommend Topeak’s Trunkbag DX, which doesn’t have the folding panniers, so the side pockets are more roomy. You don’t have a bike. Even then, it’s a really nice bag to have! When the panniers are folded, they easily fit inside the side pockets of the DXP. This means that after deploying them, folding them back is not a problem. Although the panniers are in those side compartments, you still can stuff many things there. In the left side pocket of my Topeak DXP bag, you can find my cell phone, some paper towels and two inner tubes, with room to spare! In the other one, I carry all the tools I could ever need to fix a bike, plus a repair kit and one inner tube. Topeak’s MTX Trunkbag DXP is compatible with all the MTX racks. So attaching it to the rack and taking it off is done in seconds. This is really useful if you have two or more bikes with Topeak MTX racks. I have one MTX rack, but I take the bag off the bike to unload groceries in the kitchen, to take it with me to the office when I go to work, or when I want to wash my bike. The DXP bag is fairly water resistant when the panniers are folded. If you ride under a light rain, you can be sure that all your stuff in the bag will be dry. Since I bought it, I twice rode under torrential rain. Only the things that were close to the upper side of the bag got a little humid. I was pleasantly surprised, since my cell phone and passport were there! If you regularly ride under heavy rain, then you might want to order from Amazon the Topeak rain cover made especially for the DXP, along with the DXP bag. ChainReactionCycles also sells both Topeak Trunk Bag DXP and the rain cover. The Topeak DXP Trunkbag features some 3M reflective stripes. They are located on the rear water bottle holder, as well as on the left and right side pockets. The 3M stripes are also present on the panniers (see image). Deploying the panniers reveals a vertical stripe in the middle. Nice attention to details, I would say. The 3M stripes are made from one of the best reflective tape you could ever find. On the top of the bag there’s a mesh pocket, in which I carry two maps and a pepper spray. I put my first aid kit in the rear pocket, in which you can put a water bottle. When it’s empty, the bag might rattle against the rack on less than perfect roads. In this case, you may want to insert a piece of rubber (from an inner tube, for example) between the bag and the rack. What I didn’t like when I first got the Topeak DXP bag was the top zipper. From time to time it got stuck and I had to open it and close it again. After a couple of weeks the problem went away, for whatever reason. Although it’s ok now, I don’t think such an expensive bag should have zipper problems! But to be fair, I think it’s because the zipper is intended to be water resistant, which is why it’s a little tight. 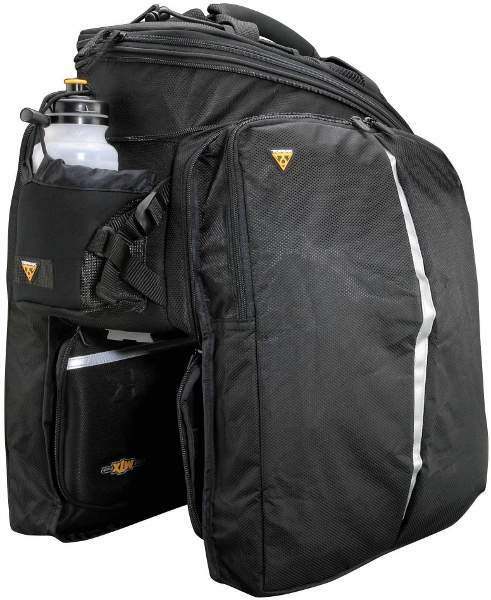 The Topeak MTX DXP bag is available at Amazon and ChainReactionCycles. And if you need the rain cover, don’t forget to order it, too. It will never stop to amaze you how much stuff this bag can hold! 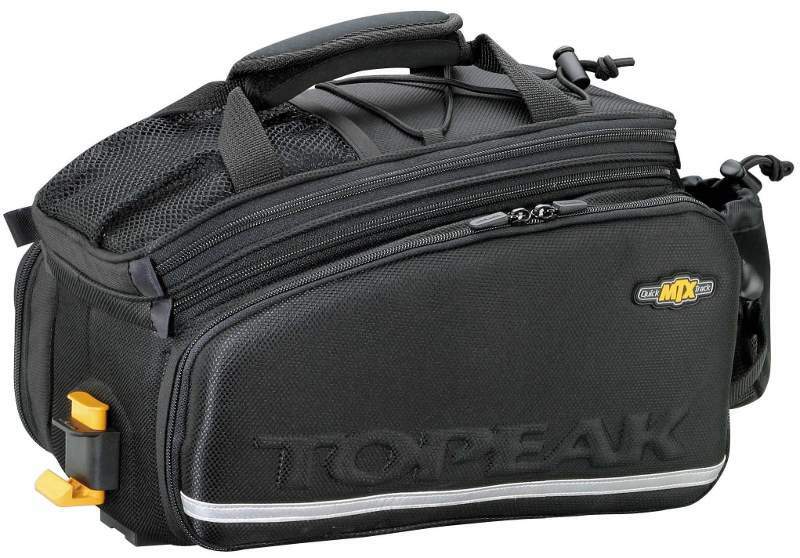 Can the topeak trunk bag be used with standard bike rack. I understand that the locking rail feature is not compatible with a standard rack. Because of this rail will it not sit properly on a standard rack? I think you could install it on a standard rack. That’s all I can say, unfortunately, unless you tell me which rack you have. What are the dimensions of the panniers when they are deployed? Also, was are the internal dimensions of the trunk bag? The panniers’ dimensions are: Length around 30 cm / 12 in, Height 40 cm / 16 in. Width varies depending on what you put in the panniers! Internal dimensions of the bag: Length 30 cm / 12 in, Height 15-17 cm / 6-7 in, Width 15-17 cm / 6-7 in (it’s a little flexible). Also, 8 cm / 3 in are added to the height at the back when you expand the top.